I hope things are going well~ Almost half way done with the week, yay :D I hope everyone on the East-coast is doing well; I'm in the Mid-West (Michigan) and the winds & the cold here are pretty crazy. For today, I wanted to share the velvet mani I did some time last week. I received pink flocking powder from Born Pretty Store recently. (Approximately) 13g of flocking powder (per description by BPS), The Face Shop's PK108 (which I received from my good friends of Chibi Nails, Jade & Xin Yi), tweezers, and a brush. The pink flocking powder package comes with the flocking powder, tweezer, and brush. 1) Base coat + 1 coat of PK108. 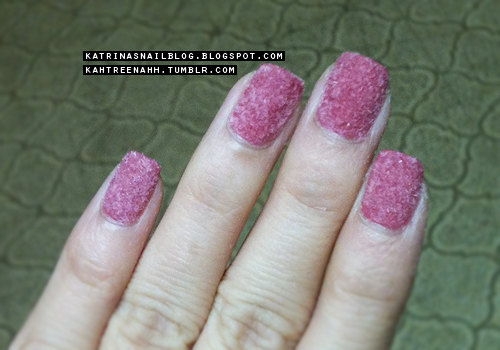 2) Applied top coat, and while it is still wet, I used the tweezers to grab some flocking powder & gently dropped the flocking powder over my nail. 3) Once the nail is covered and the top coat is dried, I used the brush to sweep off the excess powder and clean up (the brush was really handy). I honestly didn't think I would like velvet nails ... but I'm glad I gave it a shot cause I loooove em :D Of course, they don't exactly last long enough, I enjoyed them. 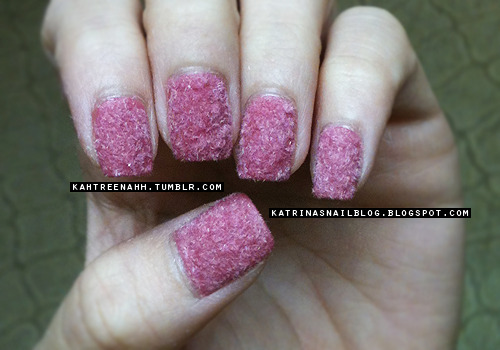 Once the flocking powder is wet, it doesn't look as pretty so I took my mani off after a day. I'm sure it could've lasted another day or two but that was just my preference. Lastly, my giveaway ends tomorrow~ Feel free to enter if you haven't yet. 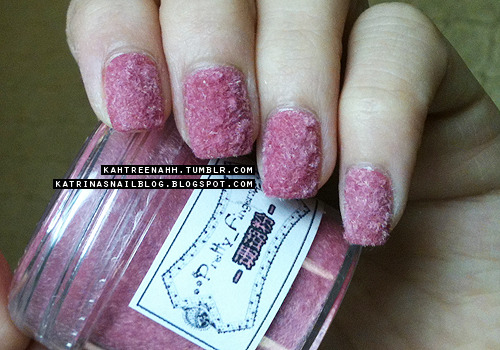 This is a very interesting manicure. It's nothing I could probably wear because I work in the food industry and we wash our hands ALOT. But, very pretty to look at. OMG! it looks really interesting! Such pretty finish!